This is only referred to as a “Colchester” type dovetail for want of another name. It is used on cross slide and top slide dovetails on Colchester lathes. The parallel gib does ensure that the dovetail works accurately. The problem with it is where there are high forces acting so as to lift the male part out of the female part it is clearly much more rigid on the side where the male and female parts touch. On the other side where the gib is, it is really only the adjusting screws that are taking the load. This can be improved by keeping the adjusting screws as short as possible, as large as possible and increasing the number of screws. One way of getting round this is the colchester type dovetail. There is no gib. There is just a male and female part But the female part is made from two pieces as shown. Making it like this means that a gib is not needed – one side of the female part of the dovetail is being used as the adjustment mechanism. This technique is often used on better-made machinery for small dovetails as used on the top slide and cross slide of a lathe. Where the dovetail is relatively long, as on the cross slide the adjustable part might be made of two separate bits only half this length. The “loose” part of the dovetail is held by cap screws marked “A”. It is adjusted by the screws marked “B”. The process of adjustment is iterative since screws “A” cannot be fully tightened till screws “B” have been adjusted and screws “B” cannot be adjusted till screws “A” have been tightened. With this type of dovetail access is needed on two sides of the female part to adjust it. It can be seen that by doing this the female part of the dovetail holds the male part using solid metal from one side right round to the other side. Once screws “A” have been thoroughly tightened what happens to the screws type “B” does not matter – they do not need lock nuts. On a Colchester type dovetail the whole of the female part of the dovetail, once adjusted, is a solid lump of metal. There is no means of locking it as there is for the parallel gib type dovetail. The photo shows an improvised lock on such a dovetail. It is the addition of the large, zinc plated cap screw. The end of the cap screw does not act on the male part of the slide directly but does so via a bronze plug. 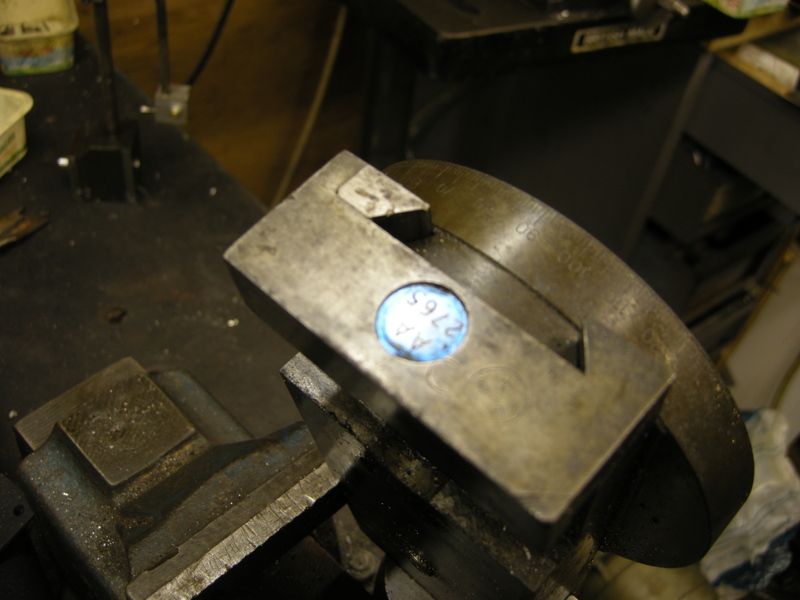 A lock on the cross slide is essential when using some types of ball turning tools. 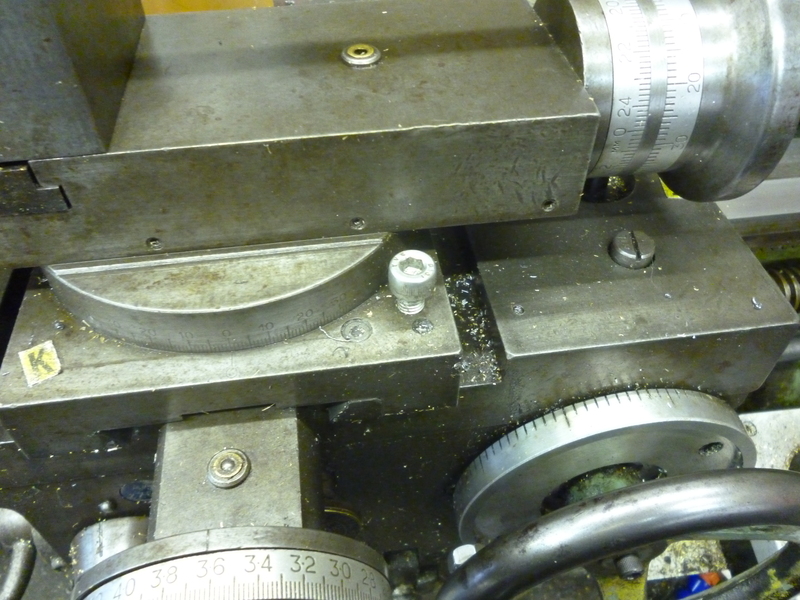 Looking for a top slide with quick change tooling for my older Colchester Lathe. 17″ Dominion with Triumph saddle. My top slide has been modified with the Tee Slot end cut off, not sure why. Not sure if I will have to build my own or I can find a used one. If you have to make your own the design I have described as “Colchester” is probably best as it is the most rigid and copes best with the force as is applied to it. In this case the force if from the tip of the cutter being forced down. The force is a twisting force. This is unusual for dovetails.